Living in a hot climate means no snow. I’ve never seen snow and the best we get in winter is flooding. Thanks to Pinterest, I’ve seen a whole load of needle felted snowmen. One snowman took my attention, as he was half melted, looking almost like the consistency of ice cream. 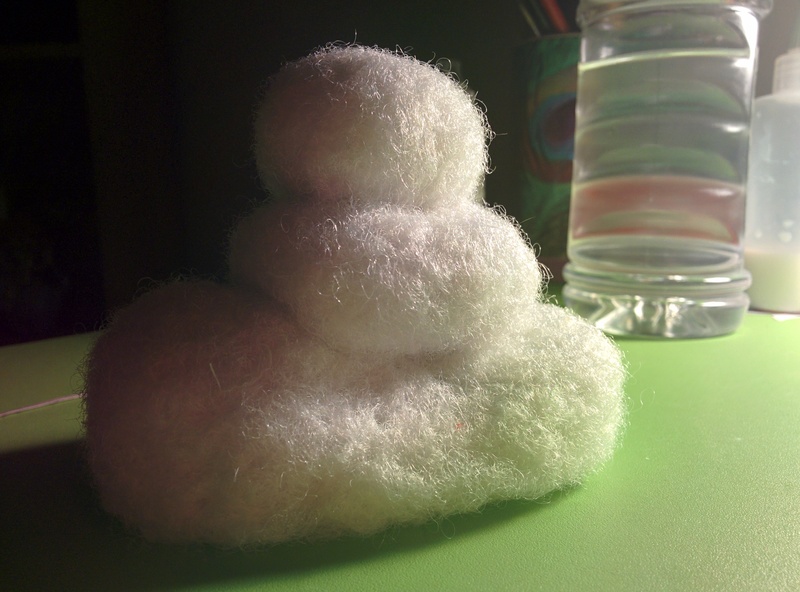 I liked the shape and the idea of making something that looks soft out of felting. The melting aspect also appealed to me, as I always find it odd that even though Christmas is in summer where we live, we still celebrate Christmas based on colder countries, with fake snow spray in windows, eggnog, and plastic snowmen. So, I think a melting snowman is a great symbol that we should evolve Christmas for our own country, if for noone else but the poor men wearing hot winter suits and beards as they dress up as Santa on 40 degrees Celsius days. At least it’s a dry heat. He turned out quite nicely, I think. The face is needle felted and it’s all done using acrylic yarn, with a synthetic filling centre. I’m still getting plenty of fluff peeling up as I hold him, so in experimenting with hairspray to try and keep him together over time. If only I could put things in blocks of resin to prevent damage and wear. Not very tactile, but at least they will last. The, yet to be named, bear is showing off a very fashionable paper pack called “Surfs Up” by DCWV. I bought it today, as is was 75% off and it’s sparkly and pretty. I also got a couple of polystyrene balls to try out a quilling thing, and some cheap polymer clay, in pink and purple. I’d usually use my super sculpey and paint it after, but I want to try out clay canes. I should be on a no mess for inspection lock down, so don’t expect a lot. 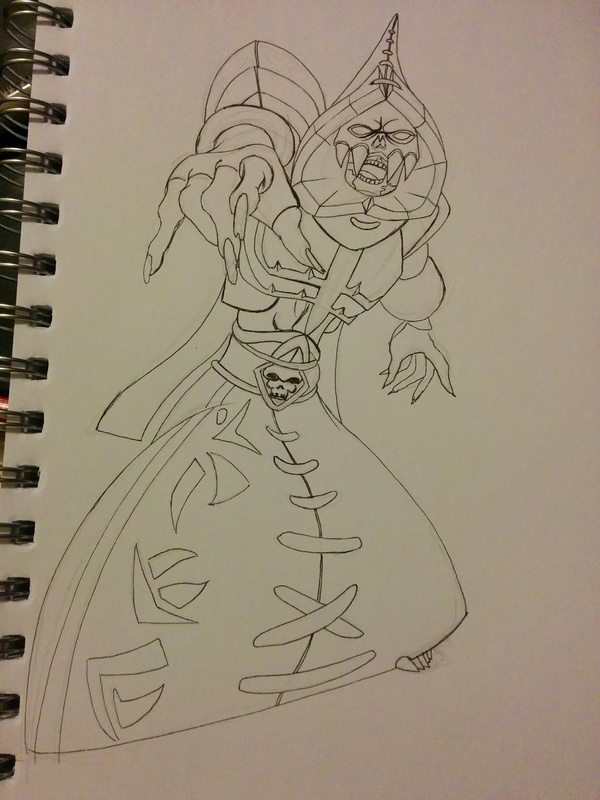 I’ll try to draw still and I have a thing to plan for that might lead to selling. Anxious about it, but also excited. I’ll be getting a theme, then having a month to come up with a product to sell that suits the theme. I’ll let you know when I know more. I know it’s to support Australian artists and getting local business. I was kinda roped into it, but I think it’ll be good for me. Just an update on the bear that I started yesterday. Had to brush out some yarn for this colour, which I found in my stash. I have some darker brown for his paws and around his eyes and ears, but just getting a base on for now. He has noodle arms, hehe. Loving this new camera-with-phone-attached. HDR FTW! Nearly true colour, for once. I haven’t been well for the last few days, so I haven’t done much in the way of moving, but today I felt a bit better, and got some things done. 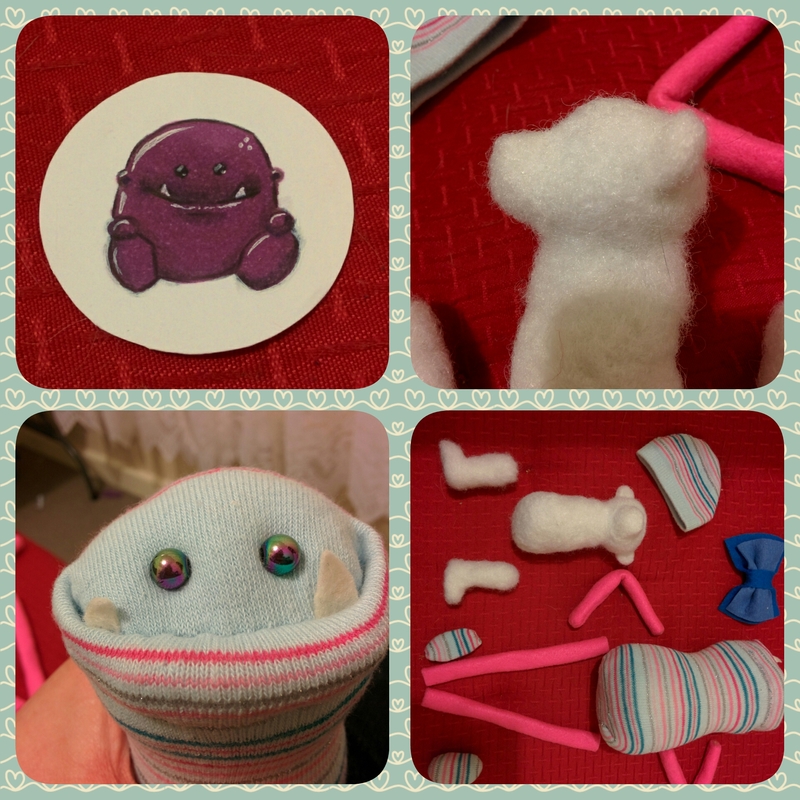 First of all, I’d like to point out that the cute sock monster was not my original idea, but I did recreate him from only a picture that I found on Pinterest here. I did however use my own techniques to make it and will not sell anything, as it isn’t my intellectual property. 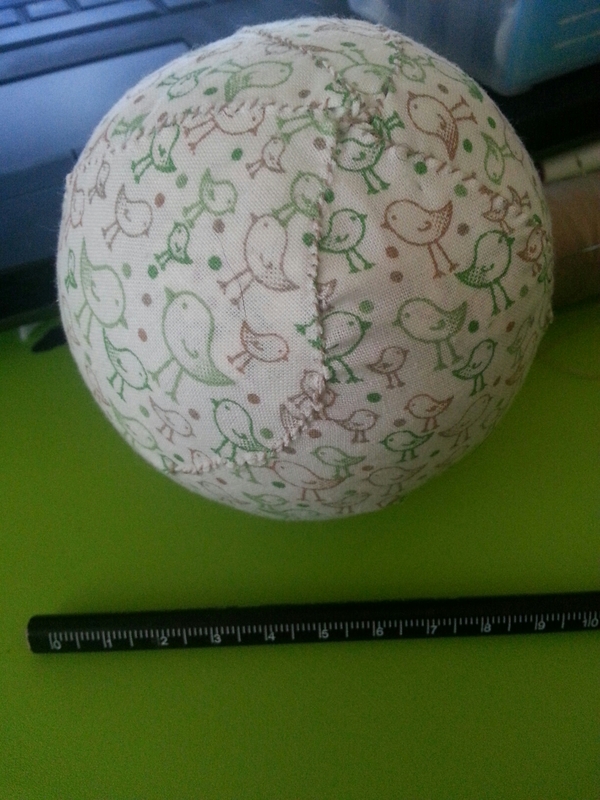 I just saw it as a cute challenge for reverse engineering, which my brain is wired to do in art and craft. A lot can be learnt by challenging yourself to recreate things for personal learning purposes. Never to sell or profit from (underline, underline.) My rules for craft is “Don’t buy what you could make,” and “Don’t sell what you wouldn’t buy.” This isn’t great for the craft selling industry, as I can recreate many things, but I don’t think my quality is great enough to sell yet. I often enjoy making things more than having them, but often can’t bear to part with things. Paradoxical is a very good word for this situation. So, when making the monster, instead of stuffing and shaping the neck with stitches, I sculpted two balls with needle felting and it kind of shaped the neck a bit. It wasn’t as dramatic as I’d hoped, but it sort of lead into making the bear. He’s all stuffing now, but he will probably end up with a nice coat of yarn fluff, in yet to be determined colours. 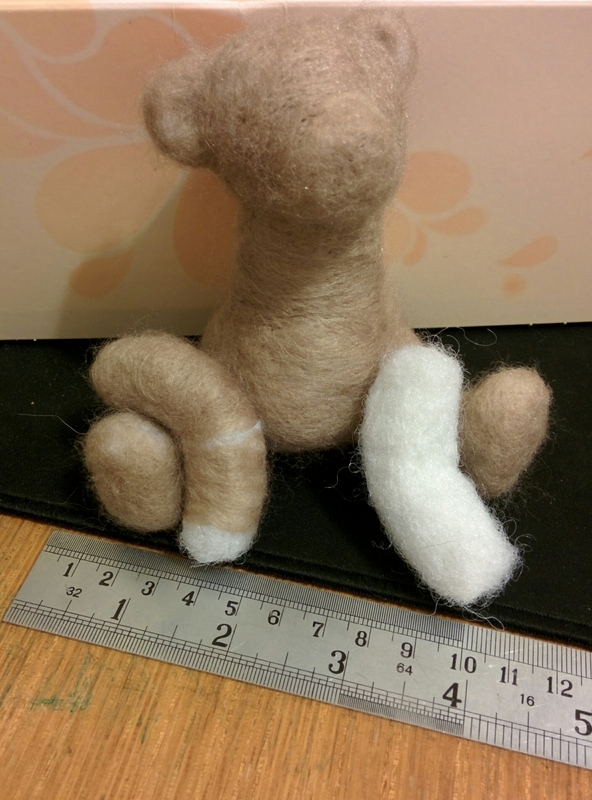 I’ve decided that I’ll attach the legs to the body firmly, but make the arms movable with a threading through method. 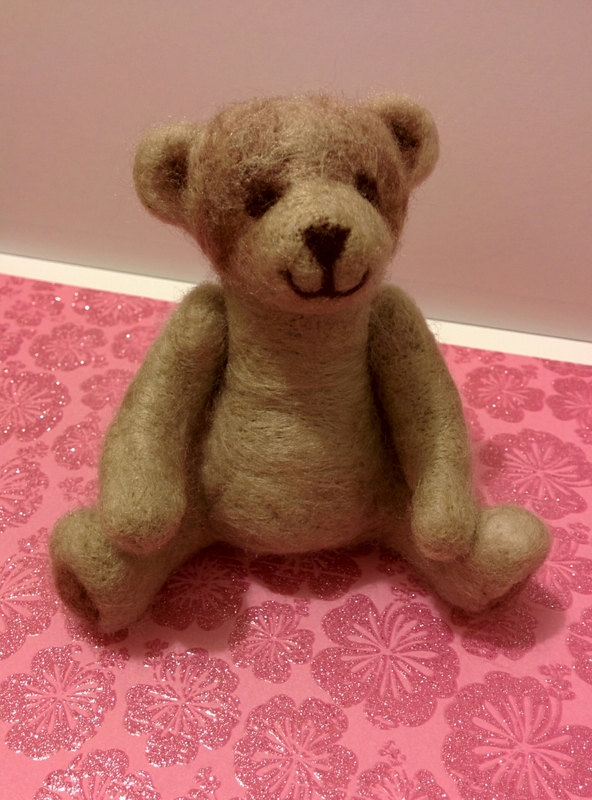 This one will probably take as long as a regular sewn bear, but less fiddly so far. Teeny bear arms are so hard to turn. 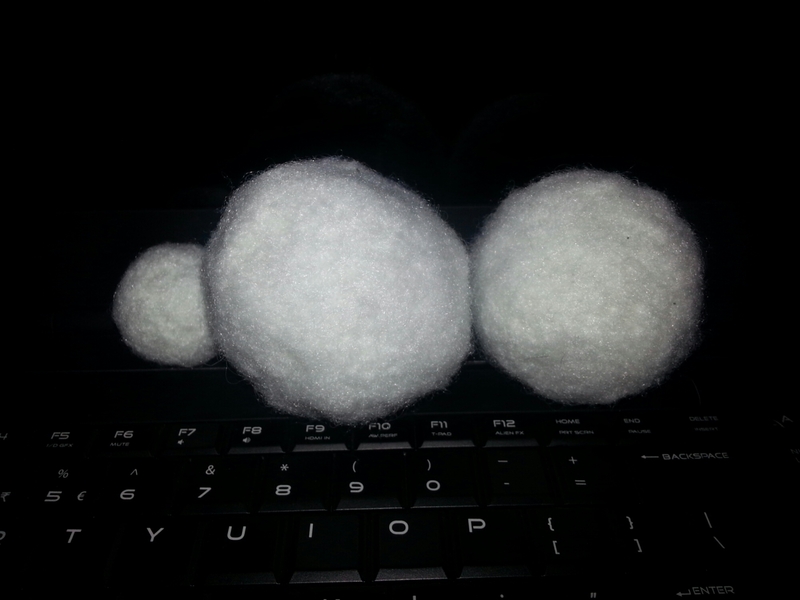 This fluffy, blobby thing is my latest project idea. It began as a paper mache torso, originally brought to decorate and be done with it. I was never sure what to so with it. It’s rather large, around the size of an 18 inch dolls torso, so would take up a bit of room for just a painted sculpture piece. I decided that I would turn it into a miniature dress form to practice sewing dressmaking techniques and designs. For years I’ve wanted a dress form, but I never had enough space, money or sewing experience to warrant one. Also useful of I find any 18 inch bodies that need clothes. 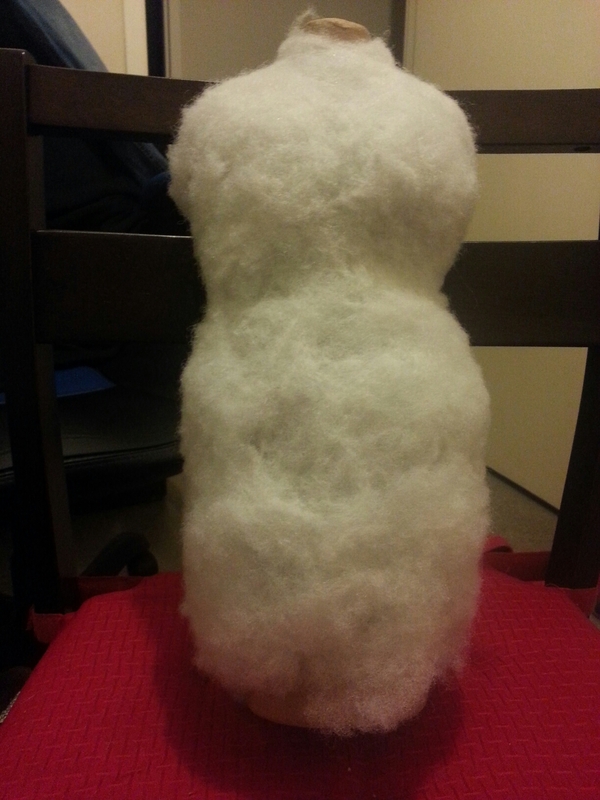 I’ve been needle felting a layer of stuffing on top of the body, for a layer to stick pins into. I’m not using glue, and could have wrapped thread around the fluff, instead, but I’m having fun felting it. 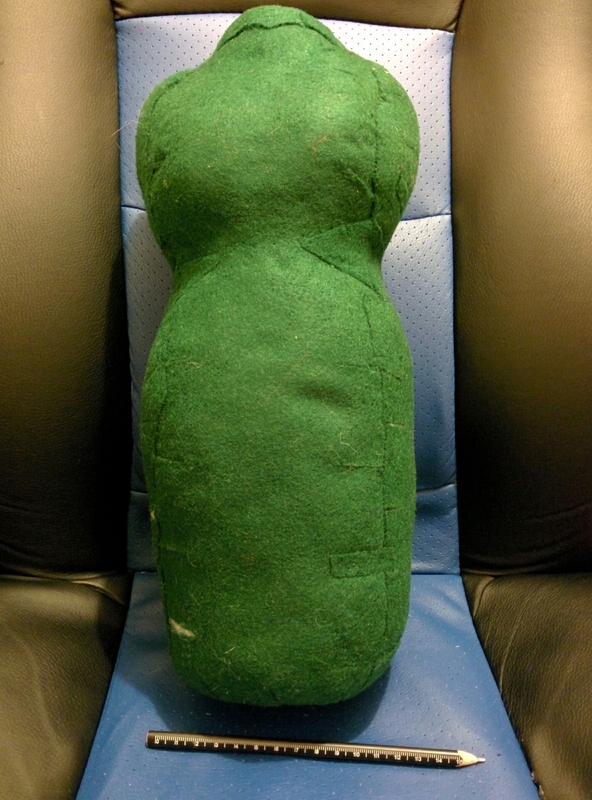 Next, I’ll sew a layer of felt, and sew firmly to the figure. I found a cardboard tube and cut a hole in the bottom of the body to use as a stand. I was going to tape it on, but it might be more useful to be able to detach the body for better access. I was thinking of anchoring the bottom of the tube stand in a container and fill the base with plaster of Paris, so it will be sturdy. Not sure yet, I’ll have to cover the tube in tape so it doesn’t go weird with the moisture. Or think of something else. I’m sure the internet has some answers. Today’s size brought to you by the letter: pencil. Really need to start cleaning for inspection again, as it looks like Santa’s elves used my house as a secondary crafting site. At least I can get away with drawing and needle felting being left out with little mess. Naahh, I wouldn’t put snow on my keyboard. Totally tricked you all. I ran out of one bag of stuffing, and had to open a new bag. This one was a different brand, and much courser feeling, which turned out to be great for needle felting. I don’t really have plans for these, they’re just fun to make and hold (and steal if you’re furry and four-legged.) I do want to make one really big, like a small basketball. They are awfully lighter than they look, and I thought they’d make great indoor balls for kids. I guess one day, I’ll use all these ideas on actual children, but until then, I’ll make and invent and share to you guys.